Certainly not everyone agrees with ESPN draft analyst Mel Kiper, but he was dead-on with the Lions and Ziggy Ansah. In his final mock draft Kiper had the Lions selecting the BYU defensive end with the fifth overall pick. Of course that’s just what happened. Ansah, who started just one season at BYU, will start at defensive end for the Lions. “I think fair expectations would be for him to be a force off the edge. ... Just make progress, come in, start early on this year and hold your own and then develop as the season goes along. I don’t expect him to take the NFL by storm — but I think he should show development, show progress for someone with such a limited football background,’’ Kiper said in a conference call on Monday. Kiper was generally favorable about the Lions’ nine drafted players. 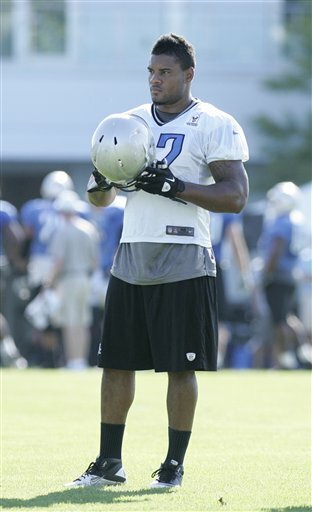 He likes cornerback Darius Slay and expects Larry Warford to start at guard. He graded the Lions out at a B. In case you can’t wait, Mel Kiper’s Big Board for the 2014 draft will be ready next week. Ronnell Lewis, the Detroit Lions’ defensive end, didn’t wait for general manager Martin Mayhew to find him after his arrest on three misdemeanor charges from a bar fight in Norman, Okla., last weekend. “I had a talk with Ronnell. Obviously disappointed whenever that kind of thing happens,’’ Mayhew said late Saturday. “I think he understands his status and where he is right now. It’s frustrating but we talked with it and we dealt it. Mayhew said it was the same deal with Amari Spievey who was charged in a domestic violence situation in March. Spievey has entered a court-ordered program and can have charges dropped once it’s complete. “Interestingly enough, there is this sort of thought that we’re attracting these guys that have all these problems,’’ Mayhew said. “Ronnell Lewis has never had any problem with the law and Amari Spievey has never had any problem with the law. Until these last two incidents. “We vet these guys, we get into their backgrounds, we dig into them. It’s unfortunate what happened and it can’t happen again, but it was a surprise to us,’’ Mayhew added. The Lions had seven arrests in the 2012 season. They cut Aaron Berry after his second arrest last July just before the start of training camp. So far Lewis and Spievey are the only arrests this offseason. Here’s what they’re saying nationally about the Detroit Lions draft class. Of course, it’s way too soon to tell for sure but these are early observations. Others have rated winners and losers in the draft and the Lions don’t seem to fit either category. ESPN’s Mel Kiper: "The pivot point for how we see this draft in three years will be (Ezekiel) Ansah. If he's great, then it looks good. If he's not, and Dee Milliner thrives with the Jets, fans will wonder." Grade: B.
ProFootballTalk.com: Hits: The Lions hit on every one of the needs we identified, and they made a particular point of addressing defensive end, taking Ansah in the first round and Devin Taylor in the fourth. After losing both of last year’s starters, Cliff Avril and Kyle Vanden Bosch, that was a high priority. ALLEN PARK — After the Detroit Lions drafted guard Larry Warford (Kentucky) in the third round, the upcoming look for the offensive line became a little clearer. Of course, this could all change with a trade or free agent signing. Lions coach Jim Schwartz said Riley Reiff, who was the Lions’ first-round pick a year ago, will start at left tackle. Riley will be able to lean on the experience of left guard Rob Sims. Warford will compete with Bill Nagy and Rodney Austin for the starting right guard position vacated when Stephen Peterman was released. Corey Hilliard and Jason Fox will compete to start at right tackle. 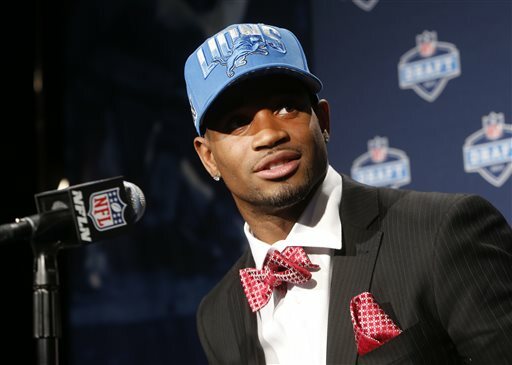 The Lions drafted cornerback Darius Slay (Mississippi State) in the second round and followed it with guard Larry Warford (Kentucky) in the third round. Both could compete for a starting spot. — NFL Network Mike Mayock: "They had an offensive tackle and corner need. Kind of an interesting pick. There are rumors, and I've confirmed it, that he's had a meniscus problem in his knees, causing a lot of teams to worry whether he'd be ready for training camp." — NFL Network Mike Mayock: "This is one of my favorite football players in the draft. Every tape I put on, he was dominant. He's square and stout. I've been waiting for this kid to go, and in Detroit, you can't be so one dimensional, and this kid is going to help." — ESPN: What he brings: Warford lacks elite athleticism and foot quickness, but he is a mauler on the inside and has enough short-area agility and inline power to open holes when locked up in a phone booth. He is exactly what you're looking for in a guard in terms of size, mass and strength. ALLEN PARK — The Detroit Lions stayed on the defensive side of the ball, drafting cornerback Darius Slay in the second round on Friday night as the 36th overall pick. 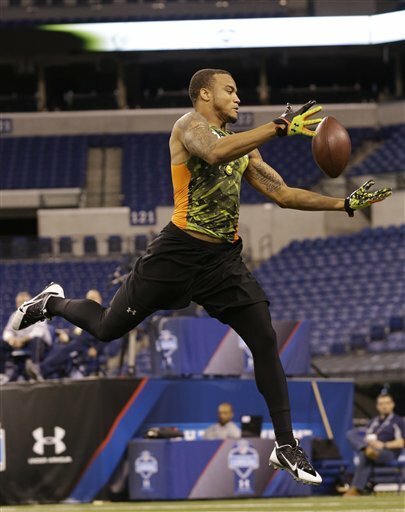 Slay had the fastest 40 time (4.36) among defensive backs at the NFL Combine. He said he gets his speed naturally. “My mom and dad both ran track so I’ve been pretty fast for a long time,’’ Slay said on a conference call. Slay, who is 6-foot and 192 pounds, tore meniscus in the offseason. Mayhew wouldn’t speculate whether he will be ready to participate in organized team activities in May. Coach Jim Schwartz said it’s not a long-term injury. Slay said when he visited the Lions a few weeks ago they made it clear they were interested. “They said they were going to grab me, so I knew when I didn’t go the first day they were going to pick me up,’’ Slay said. Schwartz said Slay will compete with the three corners drafted last year — Bill Bentley, Chris Greenwood and Jonte Green. In the past few seasons the Lions have had significant injuries among the defensive backs. “You can never have enough good corners and he’s a guy we think is going to be a good corner,’’ Schwartz said. Slay’s Mississippi State teammate cornerback Johnthan Banks was drafted by the Tampa Bay Bucs with the 43rd overall pick. “(Slay) played in the Southeast Conference, another guy when you watched the tape he really stood out — athletic, overlapped, made plays on the football, tackled all those things you look for in a corner,’’ Schwartz added. Slay was introduced in New York by former Lions’ wide receiver Herman Moore. During the television interview he was holding his 5-year-old son Darion. “I’m ready to compete, I can’t wait to get Detroit,’’ Slay said on the NFL Network immediately after the pick. In the first round on Thursday night, the Lions drafted defensive end Ziggy Ansah out of BYU. The Lions wanted to get bigger, faster and more athletic through this draft. “We’ve done that with these two picks,’’ Mayhew said. In back-to-back picks it was a situation where need met the best player available. ALLEN PARK — Lions’ first-round draft pick Ezekiel “Ziggy” Ansah has arrived in Detroit from New York. Ansah played at BYU after arriving in Provo, Utah, on an academic scholarship. He’s from Ghana where the average annual income is $1,240 according to worldvision.org. A year ago, Justin Blackmon was the NFL draft's fifth overall pick and signed a four-year $18.5 million contract. 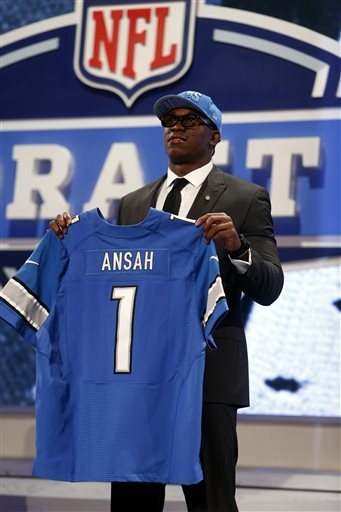 Ansah will have a press conference at 4 p.m. He’ll appear at the Lions Fan Fest at Ford Field about 6 p.m. Friday. ALLEN PARK — Bronco Mendenhall, Ziggy Ansah’s coach at Brigham Young, speaks glowingly of the defensive end who was drafted by the Detroit Lions with the No. 5 overall pick Thursday night. “The potential is unlimited. He’s fast enough, he’s quick enough, he’s strong enough, he’s a hard enough worker, he retains information well enough,’’ Mendenhall said on a conference call Friday. “He’s consistent enough on and off the field that there’s really no down side. He’s made the fastest ascent that I’ve ever heard of or seen or even believed was possible going from not having played the game to being a first-round pick. To me there’s zero reason he can’t do that from a first-round pick to whatever level they would like him to perform at in a similar time frame if not shorter,’’ the coach added. Mendenhall repeatedly mentioned Ansah’s willing spirit to learn and his athleticism despite the fact that he just started playing football three years ago. He was unfamiliar with the game which he had first seen when he arrived from Ghana in 2008. 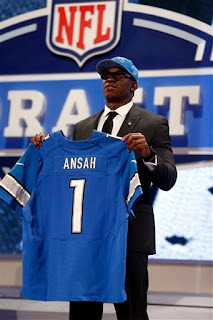 Ansah walked on at BYU in 2010 and was a starter in 2012. “He’s very smart, he retains information very well, he can learn and apply things very quickly,’’ Mendenhall said. The coach said when Ansah first started working out for him it was all different since Ansah’s background was in basketball and track. He was asking him to flip tires and do strength drills. Ansah is on his way to Detroit. He’ll meet with the media this afternoon and will be introduced to fans at Lions Fan Fest at Ford Field which runs from 5-8 p.m. Friday. In the excitement of the draft Thursday night, the Associated Press reported that free agent defensive end Lawrence Jackson had agreed to a deal with the Minnesota Vikings. Jackson — known as LoJack — was brought to Detroit in a trade with the Seahawks in August 2010. A rotational player he had a combined 46 tackles and seven sacks over the past two seasons. He had tweeted that the Lions had made him an offer, but last week he visited the Vikings and the deal was done on Wednesday although not announced until Thursday. 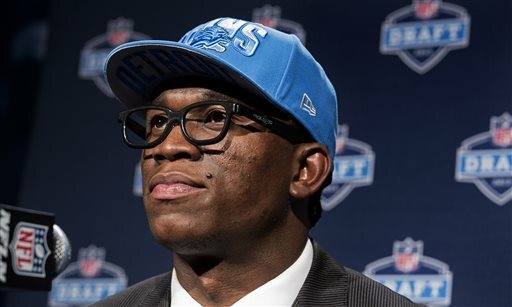 Jackson tweeted that it had nothing to do with the Lions drafting defensive end Ziggy Ansah who will wear No. 94, Jackson's number while with the Lions. Interestingly enough, the Lions host the Vikings in the season opener on Sept. 8. Jackson was a first-round pick (28th overall) out of USC in the 2008 draft. Defensive end Ezekiel "Ziggy" Ansah was drafted by the Detroit Lions with the fifth overall pick on Thursday night. Here's what draft analysts around the country think about the pick. "He never came to football until 2010 as a walk-on. He was not even on NFL teams' radars. He wasn't even on their scouting lists. He's a boom-or-bust candidate. I love the kid. Three years from now, he's an All-Pro or he's on the streets, and I don't mean that negatively." He's extremely raw and has a very limited football background. But he enters a situation where he shouldn't see very many double teams if Lions DTs Ndamukong Suh and Nick Fairley continue to crush pockets from the inside. 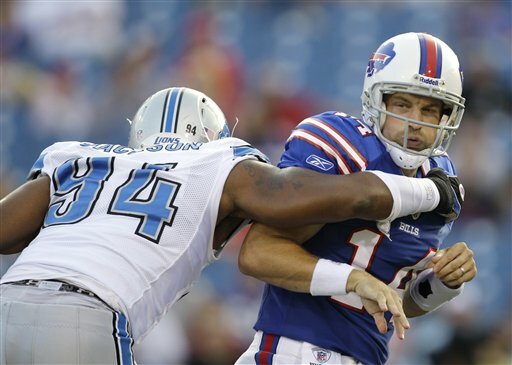 But D-line guru Jim Washburn has a big job molding Ansah into an NFL-ready player. 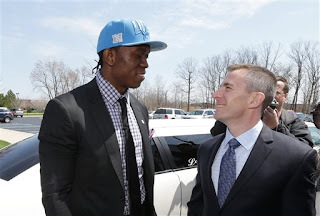 ALLEN PARK — If ever a fifth overall pick in the NFL draft needs coaching up, it’s Ziggy Ansah, the newest Detroit Lions defensive end. It could be a perfect fit although that is yet to be seen. The Lions chose the 23-year-old with their fifth overall pick in the NFL draft on Thursday night even though he’s only played football for three years. 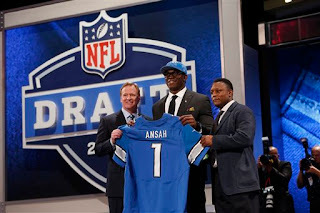 In 2010 Ansah walked on at BYU where he was on an academic scholarship. He’s played 31 games with nine starts, all in 2012. Coaching? He’ll need plenty of it because they expect him to have immediate impact. A fifth overall pick can’t be a project, at least for the Lions coming off a 4-12 season. Kris Kocurek, the Lions defensive line coach, is intense and has developed young guys like Cliff Avril, Ndamukong Suh and Nick Fairley. Also, veteran NFL coach Jim Washburn has been added to the Lions coaching staff and will be working with the defensive line. Defensive coordinator Gunther Cunningham also appreciates young players and takes pride in their development. The coaching staff knows Ansah because they coached him for a week at the Senior Bowl in January. Ansah also said he feels comfortable because he knows them. When it came to retaining the same linebacking group the Detroit Lions had for the past two seasons, it was just not going to happen. Middle linebacker Stephen Tulloch is signed for the long haul. Thanks to the salary cap, the Lions couldn’t afford to bring back both DeAndre Levy and Justin Durant. They chose Levy who they drafted in 2009. Durant signed as a free agent with the Dallas Cowboys. That leaves a hole for a starter on the outside. Tahir Whitehead, Travis Lewis and Ashlee Palmer are expected to compete for the position. Palmer might have the edge due to experience. In their rookie seasons last year Lewis and Whitehead were mostly special teams guys. It also could be filled early in the draft. The Lions could try to trade down from their No. 5 pick, but that might not be possible. It takes two to trade. If not, expect the Lions to draft a linebacker somewhere in mid- to late rounds with one of their eight picks. Notre Dame’s Manti Te’o visited the Lions, impressing general manager Martin Mayhew. “It was great. Very smart guy, very smart football player, very personable and a great personality. That’s one of the schools I went to and when I was there, you couldn’t find anyone to say anything negative about him,’’ Mayhew said. 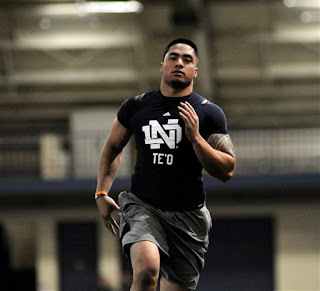 Te’o is projected by many to go late in the first round, possibly to the Chicago Bears at No. 20. Linebacker prospects Jeremiah Green (Nevada) and Vince Williams (Florida State) also made pre-draft visits to Detroit. Both are projected as seventh-round picks or undrafted. In the second round there’s a chance that Georgia linebacker Alec Ogletree could slip through to their pick at 36th overall. A converted safety, he’s only played linebacker for two seasons. And he has a huge red flag because he was suspended for the first four games last season for violation of team rules. Still in the nine games he played he had 98 tackles and made plays all over the field. He’s not as polished as Te’o but might have more of an upside long-run. Ogletree could be gone and the Lions could take him off the board due to the personal issues. Arthur Brown (Kansas State), Sio Moore (Connecticut), Jon Bostic (Florida), Khaseem Greene (Rutgers) and Chase Thomas (Stanford) are all projected as mid-draft picks. An intriguing guy is John Simon from Ohio State who was the Big Ten defensive player of the year. Reports say he lives in the workout and film rooms. Urban Meyer called him the heart and soul of the team. He’s projected as a third- or fourth-round pick. The Lions have a pick in each round with two picks in the seventh round. The NFL draft starts at 8 p.m. Thursday with the first round. It continues at 6:30 p.m. Friday with rounds two and three, and wraps up starting at noon Saturday with rounds four through seven. Back in 2005 Detroit Lions fans were stunned when wide receiver Mike Williams, who had been out of football for a year, was drafted by general manager Matt Millen. The Lions had needs, but wide receiver wasn’t one of them. Even if they needed a wide receiver, Williams was an unlikely choice. Fast forward eight years. The Lions could use some help at wide receiver, but they have other crucial roles to fill first. If general manager Martin Mayhew drafts a wide receiver with the fifth overall pick in the NFL draft on Thursday, Detroit and the NFL football nation would be stunned. “I don't think there are any shocks in our world. We have a good clue who the top guys are,’’ NFL Network draft analyst Mike Mayock said in a recent conference call. No wide receiver prospect is ranked top five. Still with Titus Young gone, Ryan Broyles coming off ACL surgery and Nate Burleson returning from surgery to repair a broken leg, Mayhew has to have wide receiver on his draft wish list — perhaps in the third round or later. Burleson said this week on NFL AM radio that he is ahead of schedule, his bone is healed and he’s been running and jumping which is surely a good sign. He revealed his five top wide receivers on the NFL Network (he’s a multi-media/multi-tasking sort of guy): 1. DeAndre Hopkins (Clemson); 2. Keenan Allen (Cal); 3. Tavon Austin (West Virginia); 4. Cordarrelle Patterson (Tennessee); 5. Justin Hunter (Tennessee). Austin, Hunter and Patterson made pre-draft visits to the Lions. All five are projected first and second-rounders which may be too early for the Lions. While wide receiver Tavon Austin is considered by many (if not Burleson) as the top wide receiver in the draft. “... (Austin) fits that mold of being somebody who can come right in and play. This guy has played football forever. I saw him in high school at Dunbar here in Baltimore, he’s been unbelievable. The kid is a touchdown maker. He’s a scoreboard changer in a variety of ways. You can get him the ball in terms of the running game, you can get him the ball on reverses, wide receiver screens, get him in space, the return game. He is dynamic,’’ ESPN draft analyst Mel Kiper said in a recent conference call. The Lions might have a better chance at drafting these wide receivers in rounds two through five. — Quinton Patton (Louisiana Tech) was impressive at the Senior Bowl (remember Jim Schwartz and his staff were coaching there) making difficult catches and getting separation. Combine 40 speed: 4.53. — Ryan Swope (Texas A&M) has been compared to Wes Welker. Started slow, finished strong last season. Combine 40 speed: 4.34. — Markus Wheaton (Oregon State) had a good 2012 season with 91 receptions, 1,244 yards and 11 touchdowns. Also had a good week of Senior Bowl practice. Combine 40 speed: 4.45. — Stedman Bailey (West Virginia) was one a big-play receiver with 114 catches for 1,622 yards and 25 touchdowns. 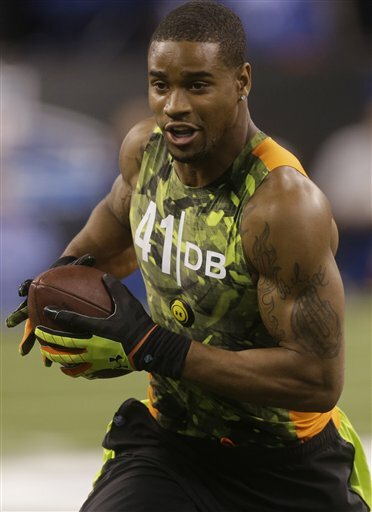 Combine 40 speed: 4.52. — Marquise Goodwin (Texas) could drop to fourth round or beyond. His college numbers weren’t gaudy, but he possesses blazing speed which helped him at the Senior Bowl. 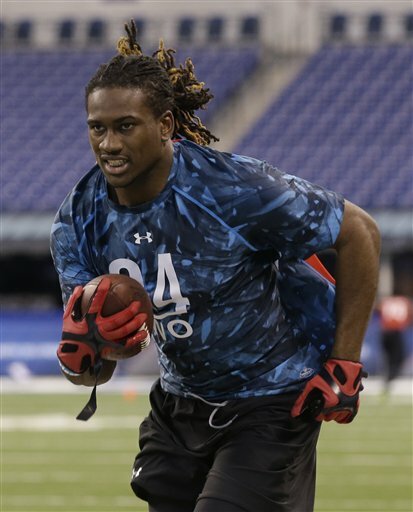 Combine 40 speed: 4.27. In the late rounds — sixth or seventh — the Lions could take a chance with Michigan quarterback Denard Robinson who ran an impressive 4.43 at the Combine. Mayhew said they’ve been tracking his development since January at the Senior Bowl. A Las Vegas bookmaker put the odds of cornerback Dee Milliner getting drafted in fifth overall — the Detroit Lions spot — as 15/2. Still don’t count out the Alabama cornerback as a possibility for the Lions who always seem to be hurting when it comes to healthy defensive backs. In a mock draft released Monday, ESPN draft analyst Mel Kiper has the Lions drafting Milliner. Gil Brandt of NFL.com agrees with Kiper. In the cornerback class for this 2013 NFL draft that begins Thursday night, there is MIlliner and then there is everyone else. Lions general manager Martin Mayhew seems impressed with MIlliner, although he’s a difficult person to read. 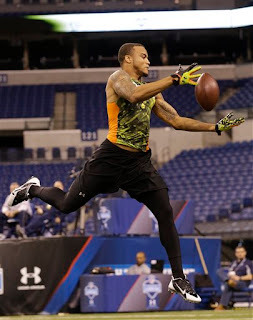 MIlliner impressed at the NFL Combine, running a 4.37 40-yard dash. He is big at 6-foot and 201 pounds and played in the SEC. Reports from the Philadelphia Inquirer this week say he might not be ready for the start of training camp following shoulder surgery to repair a torn labrum. As far as need, the Lions re-signed Chris Houston, one of their best moves of the offseason. The Lions drafted three cornerbacks last year — Bill Bentley, Chris Greenwood and Jonte Green. Greenwood was injured in May and never saw a snap. Bentley earned the starting role but after he injured a shoulder in the preseason he couldn’t fight through it and was shut down for surgery. Green got the most playing time because there was no one left. If the Lions draft an offensive tackle or defensive end with their first-round pick, they could look for cornerback help in later rounds. Along with MIlliner, they brought in three other corners for pre-draft visits — David Amerson (North Carolina State), Darius Slay (Mississippi State) and Rashaan Melvin (Northern Illinois). Second-round possibilities include Xavier Rhodes (Florida State), Desmond Trufant (Washington), Jamar Taylor (Boise State), D.J. Hayden (Houston) and Johnthan Banks (Mississippi State). Detroit Lions draft: Will Eric Fisher, Luke Joeckel be available? Martin Mayhew, the Detroit Lions general manager, was not afraid to practically gush about the prospect of drafting offensive tackle Eric Fisher with the fifth overall pick in the NFL draft which starts Thursday. That does not mean, however, that Fisher can count on being drafted by his hometown team. Fisher played football in high school at Rochester Hills Stoney Creek and then at Central Michigan University. Two reasons — he might not be available and the Lions could go in another direction such as defensive end or cornerback. A year ago the Lions drafted Riley Reiff with the 23rd overall pick and he’s likely to fill one of the three vacant offensive line starting roles — left tackle, right tackle and right guard. Jason Fox or Corey Hilliard can compete for a tackle spot, while Bill Nagy and Rodney Austin could vie for the guard position. The Lions chatted with Fisher at the NFL Combine and the Senior Bowl and had him come in as one of their 30 pre-draft prospect visits. Even if they loved him above any of the other top prospects, they might not have a chance to draft him. He’s widely considered as a top five pick, some have him going first overall. Other draft experts have tackle Luke Joeckel (Texas A&M) going first. Both expected to go in the top five though. Joeckel didn’t visit the Lions, but that is not a deal killer. Lane Johnson has risen up the charts and is another possibility for the Lions. In fact, NFL Network draft analyst Mike Mayock would take Johnson over defensive ends Ziggy Ansah or Dion Jordan if Fisher and Joeckel go in the top four picks. “People don't talk about it because (Johnson is) not a skill position guy, but he had the freakiest Combine of any player I've seen in 10 years and I think his upside is unlimited,’’ Mayock said. “So you have to decide whether you want Lane Johnson right there, or whether you're going to take a chance on a Ziggy Ansah or a Jordan if he's there. And to me if you're projecting an Ansah or a Jordan, who did not have all that many snaps, I'm going to probably sit there and take Lane Johnson. Because on the other side of the line of scrimmage, Ansah and Jordans, you have questions, also. So if you have questions with all three of them, I think I'm going with a tackle because I need one,’’ Mayock added. While offensive tackle seems the likely direction if the Lions are looking for offensive line help, guard is a possibility too. Mayhew cracked the door on that chance in his pre-draft press conference discussing how the rookie salary cap changes have made it easier to draft a guard with a high pick. The two guards projected as first-round picks are Chance Warmack out of Alabama and Jonathan Cooper from North Carolina. Warmack had a pre-draft visit in Detroit. “I think (Warmack) is certainly a great player. I just think when you look at that position if you can get a (CB) Dee Milliner or a pass rusher against Aaron Rodgers and Jay Cutler and people like that ...’’ ESPN draft analyst Mel Kiper said in a recent conference call. "Two quarterbacks in that division, of course led by Aaron Rodgers, you have to go through to get a playoff spot. I think a corner or a defensive end would be the guys to consider,’’ KIper said. “Warmack is a heck of a player, and it's helping out your running game because he's a great run blocker, and it's helping out Matthew Stafford, but I would be surprised if they didn't take a defensive end or corner." Kiper should know better. Mayhew surprised a few people last year taking Reiff and a few more the year before with Nick Fairley at 13th overall. One thing is for certain with the Lions at draft time, nothing really can be surprising. The Lions will also look to offensive line help in the later rounds no matter who they draft in the first round. Guard Brian Winters (Kent State), projected as a second- or third-round pick, also visited the Lions. As did tackles Vinston Painter (Virginia Tech) who is seen as a third- or fourth-round possibility, and LaAdrian Waddle (Texas Tech) who could be drafted in the seventh round or a free agent. Also Travis Frederick (Wisconsin), the top-rated center who could go in the second round, visited Detroit.